Calling all Disney fans, all jazz fans, all music fans. I am so excited about the new Jazz Loves Disney album.Jazz Loves Disney is a collection of classic jazz versions of beloved Disney songs. It has such a timeless energy. These songs take me back to the good ol' days. I have been a Disney lover for longer than I can remember. I have seen all the movies more times than I can count, and I know almost every word in the movies. I do know every word in all the songs and I can never help singing along. I love that when I watch a Disney movie or listen to a soundtrack or song that it transport me back to a simpler time. It makes me feel calm and happy and just instantly lifts my mood, no matter how I was feeling before. I love being able to share my love of Disney with my children, as my mother shared hers with my siblings and me. It helps us make memories and start traditions. It gives us more excuses to spend time together as a family and helps anchor those family times into lifelong memories. Having a song linked to a memory, makes it much easier to recall. My kids love Disney as much as I do, and they both love music. With my son being autistic, music is a really great outlet for for him. He struggles with self expression and has sensory issues. Music helps him so much. I love hearing him sing along to our favorite Disney songs. I love that I can share jazz music with my kids but still have the songs and the themes that they really care about. This album is really great, we have been listening to it every day since I got it. Our favorites are: Bibbidi Bobbodo Boo, Everybody Wants To Be A Cat, and I Wanna Be Like You, but they are all so much fun. As you can see, there are lots of great songs from classic to current. I would love to know more about all of you. What are your favorite Disney songs. Is Disney just a casual interest for your family or is it a lifelong passion and tradition like it is for our family? Do you like jazz already or are you not normally a fan? Do you plan to seek out the Jazz Loves Disney album or songs? Please discuss in the comments. 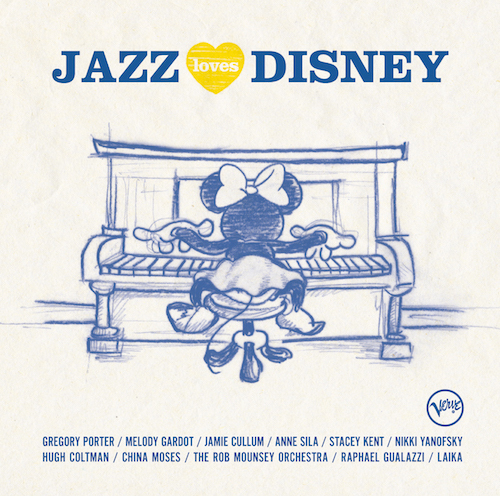 In the meantime, you can find the Jazz Loves Disney Album on iTunes and Amazon.